Our latest contribution to Agency Access’ blog The Lab is posting today. It offers advise for photographers regarding website design. Be sure to link to the blog directly to read answers from industry experts on many more questions. Question: Do clients expect cutting-edge design from your website or are they just interested on the work being displayed? A commercial photographer’s website is the single-most important marketing tool available. While portfolios are a powerful way to see imagery in its purest form, they don’t allow the same access to the work that websites do. Because the potential is so high for so many people to see the work on a website, it should be a priority for a photographer to keep the content, design and functionality up to date and fresh. Over the years, website design has evolved. At first, clients loved to see uniquely designed sites that showcased creativity and style. It mattered less that the functionality was challenging. Instead, because the whole idea of websites was new, people enjoyed visiting sites that were inspiring and creative. As people became more accustomed to using websites, photographers were encouraged to think about ease of use. Visitors no longer wanted something overly designed with complicated navigation. Instead, they wanted to be able to get into the site easily, review the images and get out just as easily. It was no longer just about design. They wanted function as well. Services such as Livebooks and APhotoFolio helped photographers streamline their design by providing customizable templates that still showcased their own vision and personality, but at the same time met that ease-of-use demand. The back-end technology evolved as well, with services allowing for greater flexibility in changing out imagery, which was very important. It took the updating out of the hands of the designers and put it into the hands of the photographers, which allowed for more affordable and frequent changes. Photographers who embraced the suggestions and tried the new services were rewarded with frequent visitors and clients who were happy to share their sites. We often heard art buyers say that if a site was too complicated and had too many bells and whistles, they just didn’t visit it. There wasn’t enough time to dedicate to that one site. These new, easy-to-navigate sites became the norm. When we look at where websites are headed today, we see a few trends that are making the website experience even more powerful. Photographers are beginning to showcase their images larger. It is a breath of fresh air and clients like it. Many photographers are no longer just photographers, but self-described content creators. Many are embracing video, creating apps, selling stock and providing other types of content for the commercial world. Therefore, their websites are no longer just showcasing their photography. Photographers who utilize services like Livebooks and APhotoFolio are beginning to push the envelope and customize the templates to differentiate themselves from competitors using the same service. Photographers are embracing the power of the story behind the photographer and the imagery. They are blogging about everything from personal work and iPhone photos to industry commentary and images’ background stories. Clients are enjoying the blogs and see them as a way to get to know the photographer better, and to find inspiration for their projects. By now, we all know the value of word of mouth and the power of social media. In response, photographers are allowing, and encouraging, viewers to share their site and their images via social media. Doing so increases the numbers of viewers exponentially. When I look back at the evolution of the photographer’s website over the years, the pendulum’s swing between form and function becomes obvious. For the reasons listed above – and the education that has occurred over the years, plus the technological options available now – photographers now have the opportunity to have their strongest online presence. 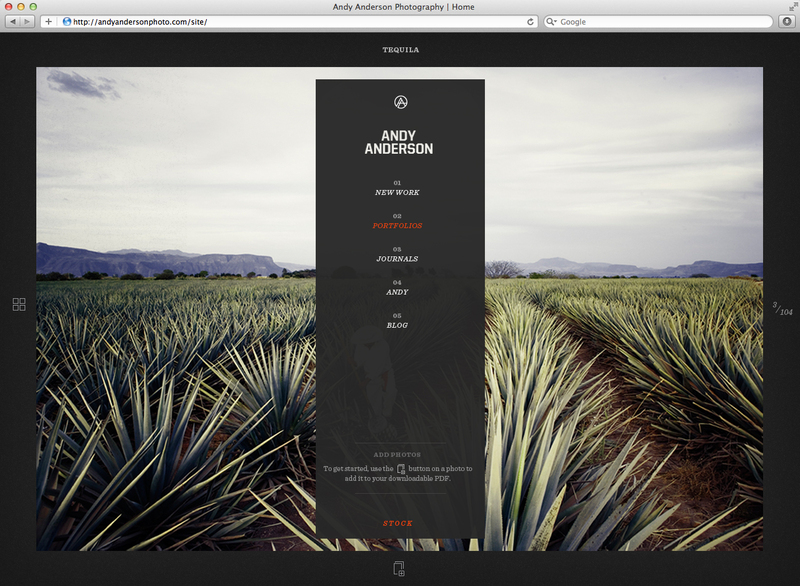 NOTE: Thank you Andy Anderson for allowing us to use a preview of your new site as our featured photo. I am excited to see the site once it launches!